Christmas on Brambleberry Ridge is beginning to ship out to stores, cue the Christmas music! Christmas on Brambleberry Ridge pulls some of my favorite prints from previous collections in tones of reds, greens, and gold. Each line I create tells a story and now it feels like my favorite friends (and hopefully yours) are coming home for the holidays! From the original Brambleberry Ridge line you will see some returning favorites. From Waterfront Park, the birds from Flight soar in a trio of shades. They like to fly in from time to time and you never know when they will make another appearance! Reflection gets fancy with the addition of metallic gold in Shimmer Reflection. Perhaps a couple of my favorite prints come from Madrona Road, but don't tell the others, I don't like to play favorites with my fabric. Wild Carrot a lovely, simple floral and Memoir a true fairy tale. Memoir is available in two colors, a beautiful red and a dreamy metallic gold. Just in time for the holidays you can snap up Christmas on Brambleberry Ridge and get way, way ahead on your holiday sewing! I can't wait to see what you will create! Here is a little project I had a great time putting together for Janome. The full instructions can be found on Janome's Project Page- HERE. I love to add a little bit of patchwork to our home every chance I get. This Spring I have been admiring some contemporary watercolor quilts, also referred to as color washing. 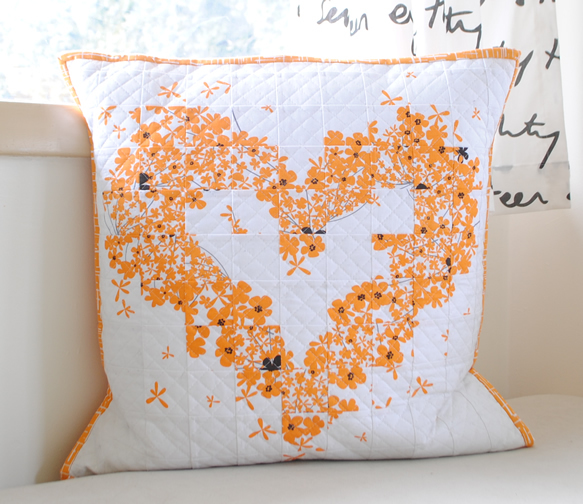 My style frequently combines a little something classic with a little something modern and for this project I had the idea to use only one modern print and one solid to create a flowering heart pillow. I had the perfect print in mind and my assistant agreed. Look for areas of loose or solid background when selecting a print to work with. Then select a solid closely matched to the background color. For my example I chose Wild Carrot from my Madrona Road collection matched with white background. Head over the the Janome blog and check out the rest of the tutorial! Favorites from the Madrona Road Challenge! 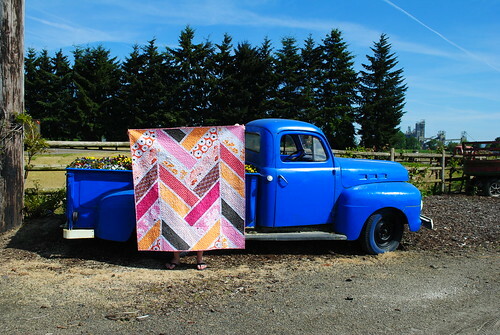 Recently I had the most difficult task of picking my favorite project from The Modern Quilt Guild / Michael Miller Fabrics Madrona Road Challenge. There were hundreds upon hundreds of amazing entries and more are still pouring in even though the official deadline has passed. I am so thrilled that everyone is still finishing their projects and I plan to keep looking through all of them as they come in.
. To quote her, "In short, I wish I'd made it and I want to steal it. I want it. I will take it and hide with it for years in an underground cave, and then after I lose it in a game of riddles, I will follow a pair of tricksy hobbitses through the gates of Mordor only to jump into the fire of Mount Doom to be with it forever. My precious." Thank you so much Lindsay! Above are the two I could not separate from being my favorite. Below are in no particular order of awesomeness. Click on the photos to see their Flickr streams. Again, thank you SO MUCH to everyone who participated in the challenge. 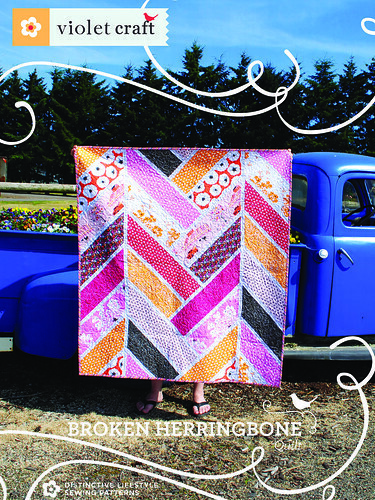 Broken Herringbone Quilt - The Pattern! 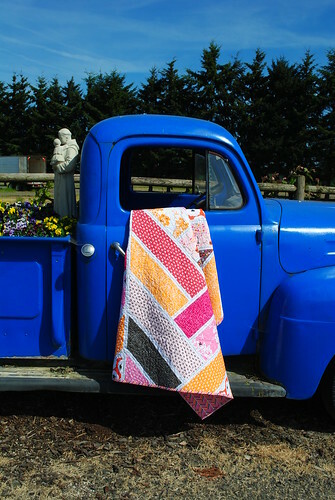 The quilt showcases fabrics in a bold manner, but in a fresh, modern, on-trend way. This is a perfect pattern for those fabrics you've been waiting to showcase! 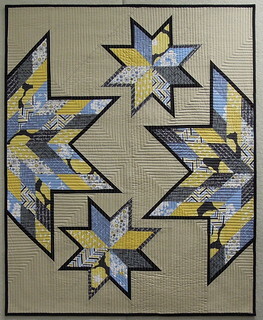 The pattern also puts a unique twist on quilt construction. There are no traditional "blocks". 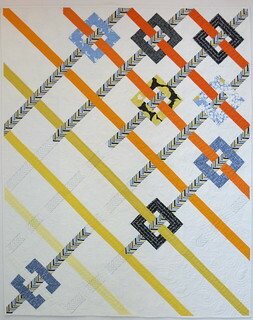 Quilt is constructed entirely of full width of fabric strips. 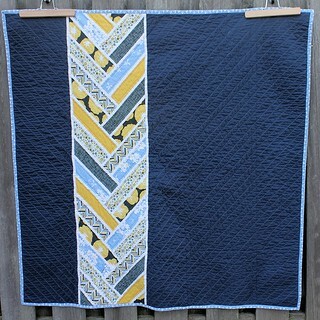 I think you will be surprised how simple it is to pop this quilt together. 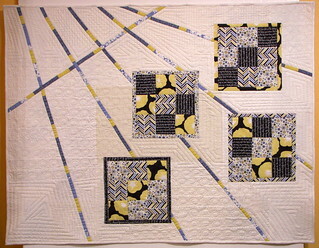 There is VERY minimal scrap production and the pattern includes diagrams for two examples of how to use all of the scraps in an interesting quilt back. Exact dimensions are not included for pieced backs. You may recognize the truck in these photos from Madrona Road. My love affair with the trucks on Sauvie Island goes back to exploring the island alone when I first moved to the Pacific Northwest. At that time there was only one beautiful truck exploding with tulips. In 2005 I took my youngest daughter and a dear little friend there for a photo shoot for my handmade children's clothing line, KungFuBambini. Warning - cute baby overload! I included my illustrations of the truck in the Madrona Road Farmstead print. 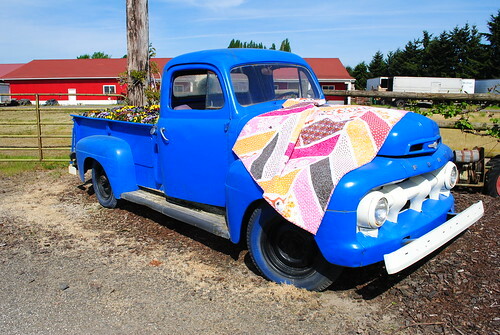 Last year, when we returned to take the pictures of the quilts, there were two new beautiful additions, one of which is the blue truck above. You'll be seeing more of these trucks from me. It's a magical little place and I hope to return there for years to come and find them full of blooming flowers. Warning: there are no pictures in this post. Just words. I am bawling right now. Absolutely crying. And every one of them is a happy, happy, happy, HAPPY tear. 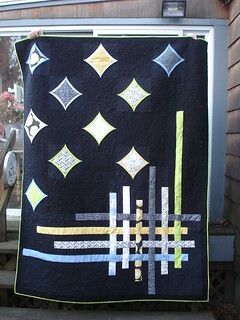 The Modern Quilt Guild Madrona Road Challenge has put me over the edge. 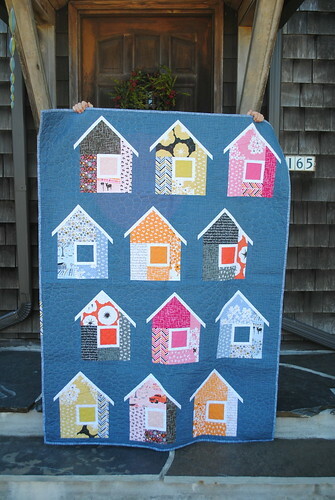 Last May I showed Madrona Road, my fabric collection for Michael Miller Fabrics, at Spring Quilt Market in Kansas City. I love this collection. I put my whole heart into designing it. Our family had been through a lot by that time last year. We were in the process of short-selling our home and changing everything we thought we believed about what we "needed" in life. I wrote Memoir of Madrona Road during that process. It is a very true story about a girl from Kansas making her way in this big world of ours and finding herself and the love of her life in Oregon. About 3/4 of the way through, the story goes on to describe a fictional place called Madrona Road. At the time I designed Madrona Road, I think I thought that magical little road with the sweet little farm was really and truly what we were looking for. But since then, with ever more changes in our lives in the short span of a few more months, I've realized that the life I created in that little story will exist wherever our family lands. All that matters is that we are together and making the absolute best out of this life that we can WITH WHAT WE'VE GOT. 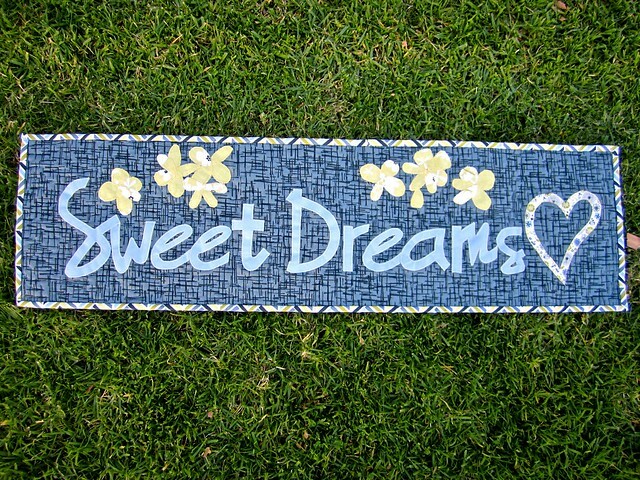 Dreams are so important, but loving what you have right here and right now is so much more important. Making do. It seems like that's exactly what all of you have been doing. 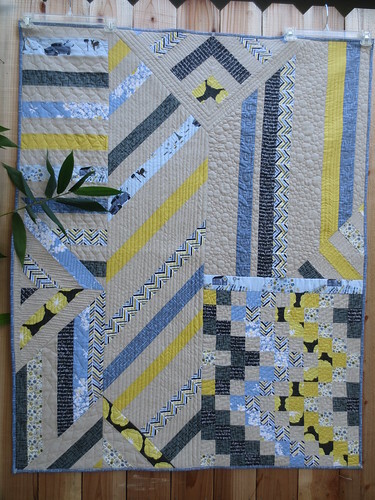 The Modern Quilt Guild Madrona Road challenge deadline was last night and I have been watching the progress daily on Flickr, Instagram, Twitter and blogs and it's been so exciting and fun. Then today, seeing 262 entries in the finished Flickr pool and 473 photos in the progress Flickr pool, well, it just did me in. I've been looking through them and bawling ever since... I am supposed to pick one favorite. I don't think I know how to do that. I love every single one of them. Just thinking of the energy of all of those sewers all stitching, well, it just makes me cry harder if you must know. Please, oh please... if you are on Instagram, tag me!!! I am @violetcraft and I check the #madronaroad and #madronaroadchallenge tags daily also. #peacocklanefabric gets used occasionally which makes me smile a little secret smile - and just as a tiny happy teaser, get ready for #waterfrontpark in a few months. Yes, I now openly speak in hash tag language. I'm okay with that. Rag & Bone Bindery is featuring Madrona Road! chose Madrona Road as one of their exclusive limited edition fabric cover choices for their online Trunk Sale! The trunk sale begins today, Thursday, August 9th through Monday, August 13th, but the limited edition prints are first come, first serve and when they're gone, they're gone! they've created using my fabric and enjoy the 25% off while you're at it! Oh decisions, decisions! Should I order the Wild Carrot, Morning Glory, Broken Herringbone or Farmstead? Oh... that donkey!!! Sold our Portland home, hooray! Went to Kansas City quilt market, hooray! Moved to Manzanita, OR, hooray! Came down with the flu, boo! Followed that up with walking pneumonia, boo! We live at the beach (for now), hooray! Feeling better and back to work now, hooray! Now that we've got that over with, hehehe, let's move on, hooray! My little helper Cannon was barely tall enough to hold up the quilt for me, but she was a trooper! This was taken on the front porch of the house next to ours here in Manzanita. 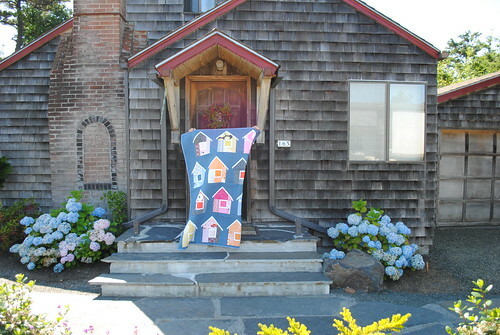 I love how it looks like the quilt could have been styled off of this house - but it wasn't at all. Today it is 78 degrees here. That is about ten degrees warmer than it has been most of the summer. I think I'll go outside now and breathe in some of it. My lungs are still on the mend and I'm moving pretty slowly. This little slow town is just about the perfect place to heal. 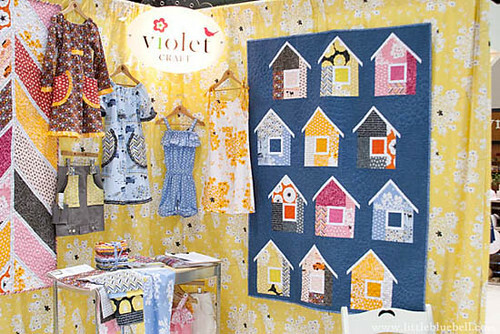 The Quilt Show, Quilt Market and Sew, Mama, Sew! Giveaway Day! I have so much to tell you! Where to start, where to start??? Next, I just got back from Spring Quilt Market in Kansas City! It was a total blast and I am completely exhausted. Here is a little sneaky peak of my booth in the Michael Miller neighborhood. Now, let's get to that Giveaway Day! 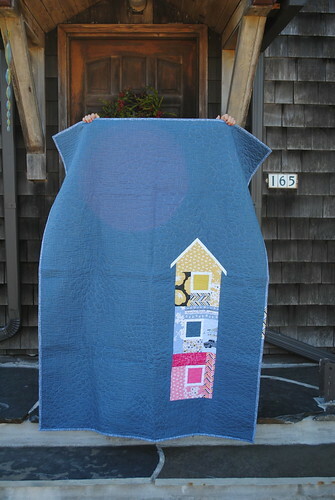 I am going to give away TWO bundles of Madrona Road. One in the Ocean colorway and one in Citrus. to Sew, Mama, Sew! to enter more awesome giveaways! It's Coming.... Madrona Road is at the mill! 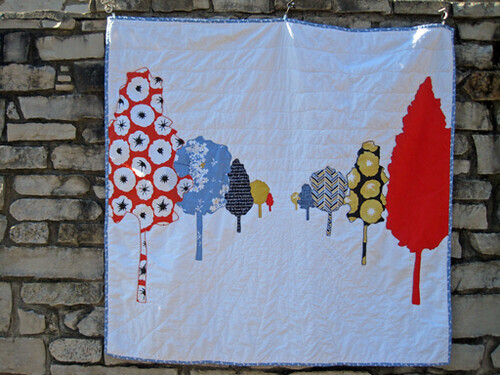 Spring Quilt Market in Kansas City will find me with my new collection, Madrona Road. It is at the mill now and I hope to be able to start sharing photos of it in just a couple of short weeks! Since then, I'm seeing the Falling Flowers pop up as modern basics in wonderful patchwork creations all over my favorite blogs. 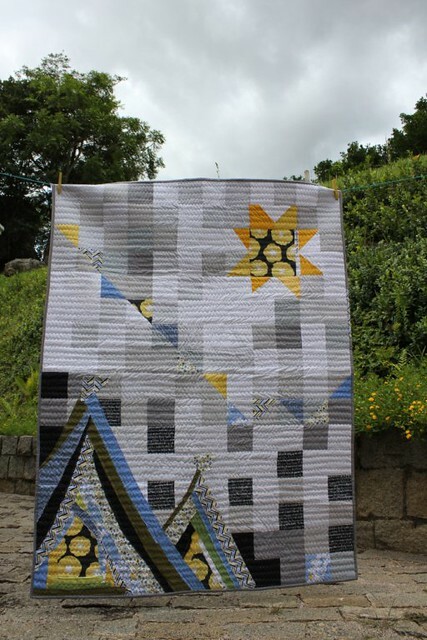 And just yesterday I ran across this quilt that made me stop dead in my tracks. I am in LOVE with it. 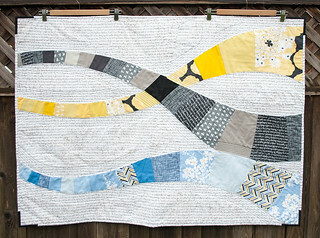 And this Swoon Quilt is literally making me swoon. A heartfelt thank you to everyone that chooses to use Peacock Lane in their creations. It gives me so much joy to see it come to life in the hands of sewists.